In the world of today it is common to travel a lot. And it is also quite common to relocate. There are various reasons people choose to move to a different city or even state. It can be because of work, for example, when you have got a great position far from home or the company you are working for is relocating. Or you might be looking for a town that will be better for your family, with better schools or other factors. Or it is time for you to leave your parents’ house and move to start your college life. Or maybe you are just looking for a place where you belong. There are hundreds of reasons to move far away, but moving a car is also a part of the relocation process. And to make it easier, you can use Auto Shipping services. Tucson Car Transport will be happy to make your relocation a simpler process with our Tucson Auto Shipping services. We can ship any kind of car in any condition to any place in the United States. We even ship to such remote locations as Alaska and Hawaii. We arrange the whole process of Tucson auto transport from the very beginning so you don’t have to worry about anything. 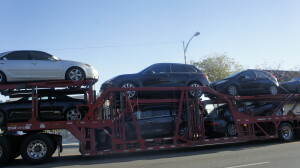 We can ship your car with open car transport or enclosed. You can choose whatever works best for you. Open auto transport is the most common because it is cheaper and more available. Enclosed is best for Exotic auto shipping. If you are not sure, our agents will help you and answer all your Tucson car shipping questions. Our prices are never final and we can lower a price for you! We often beat our competitors’ quotes. With Tucson Car Transport you also can always count on a special discount. Get a free quote from us today!